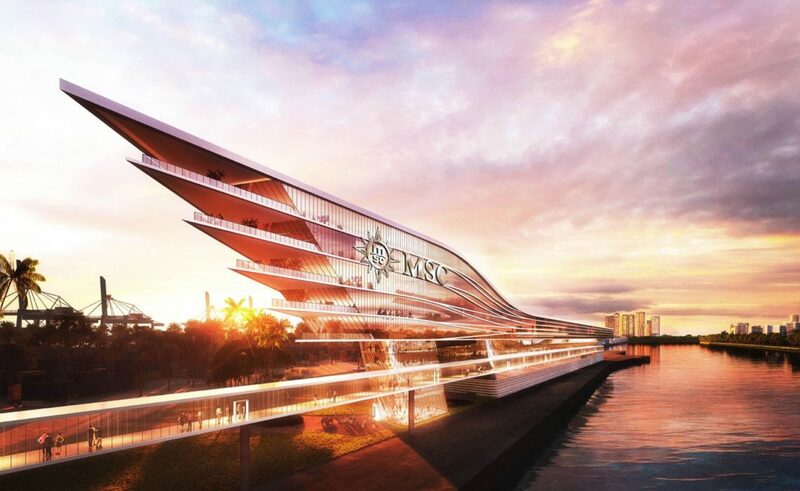 MIAMI BEACH — MSC Cruises became the latest cruise company to unveil designs for a deluxe new terminal at Port Miami, joining Royal Caribbean Cruises Ltd. and Norwegian Cruise Line Holdings in building a futuristic-looking structure on the channel where cruise ships depart the world’s largest cruise port. “With another 13 cruise vessels due to join our fleet in the next eight years, our ambition is to have our most innovative ship classes represented at PortMiami, bringing a wealth of choice to our North American as well as international guests,” MSC executive chairman Pierfrancesco Vago said. The terminal plan is another sign of MSC’s ongoing commitment to developing more business in North America.